“It is a service that is not suited to everyone – we realise that. However, bigger customers who have a large requirement for translation and they have existing ‘Translation Memory Databases’ could benefit significantly from this enhanced capability. Essentially we are taking their translation memory databases to create a translation engine dedicated and tailor made to their own style, tailor made for their business. This enables a first pass translation via the engine followed with human post edit. 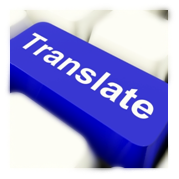 Not only can this drastically reduce the time taken to translate, but you can be looking at around a 30 to 40% reduction on human quality translations”. It is an important feature of our company, that we are forward thinking, always at the forefront of cutting edge technologies, yet an independent company that listen’s to the need of every client. Every client is treated as an individual, creating a feeling of mutual partnership. To enquire about machine translation for your business do not hesitate to contact Foreign Language Services: T: +44 (0)1785 255067 or E: translations@fls-ltd.com.